Who doesn’t know someone like that? In other news I’ve lost the top off my biro. I know which is more relevant to me. Banker Fred Goodwin losing his knighthood is a bit of a non-story for me. 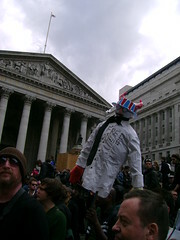 The whole honours system is already in disrepute not by the shame of having to strip some banker of his title but in the fact that he was given one in the first place! How someone decided that running a company into the ground is reason for offering them a knighthood for ‘services to banking’ is beyond me. To be honest it’s not. It’s symptomatic of a system that is run by the elite for the elite. I also really can’t be bothered whether he keeps his knighthood or not. 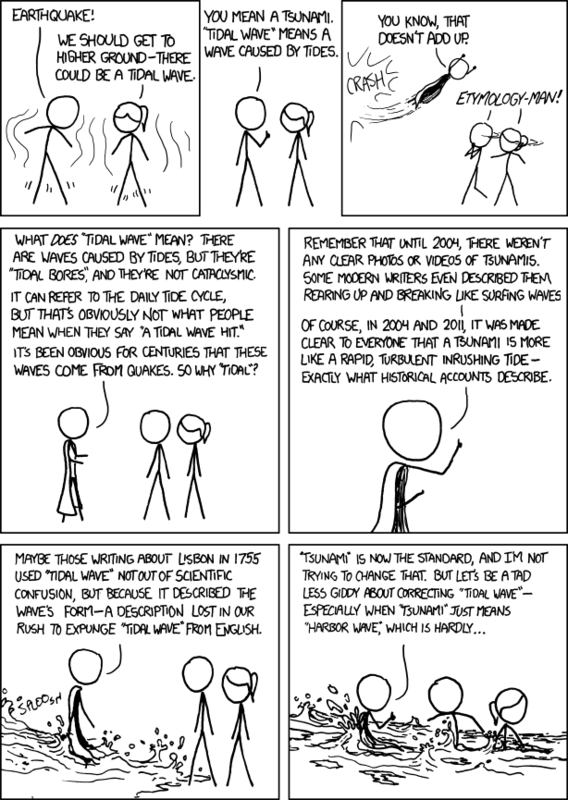 I’d never call anyone ‘Sir’ or whatever just because some oaf decided that I should. What I would like to see is Goodwin being stripped of his booty from the wreck of the good ship RBS. That would be a sight worth seeing and would also send a message that the days of rewarding failure are over. Okay, they may not be new as in new but they are new to me. First up is The Spiritual Vision of Pope Benedict XVI edited by Robert Moynihan which I’m reading at the same time as Eschatology. Second is Jesus of Nazareth, Holy Week: From the Entrance into Jerusalem to the Resurrection by Pope Benedict XVI. I read the first volume a few years ago and was really impressed with how readable Benedict’s works are. Please feel free to link up with me on Librarything or Goodreads! A union in Lithuania has been barred from striking at a brewery because the owners have managed to get the courts to view beer production as an ‘essential service’! Management attacks on workers and their unions continue at Carlsberg, the world’s 4th largest brewery company. A planned strike by union workers at the Carlsberg brewery in Lithuania has been declared illegal by an outrageous court decision which is now the subject of an ILO complaint. The court denied the right to strike by declaring beer production an essential national service! Carlsberg is retaliating against the union’s struggle for justice with reprisals and dismissals and using the Lithuanian legal system to destroy union rights. Use the form below to send a message to Carlsberg and to the government of Lithuania telling them to stop violating workers’ rights! So says the BBC. No, I don’t think he really is calling for a form of Distributism, merely offering up sound bites that seem to be rounding the edges from our current form of rampaging Capitalism. There’s lots of talk in political circles at the moment of a more ‘friendly capitalism’ and I think he sees this as an opportune moment to claim some media time. “We don’t believe our problem is too much capitalism – we think it’s that too few people have capital. Clegg’s call is not for a more responsible capitalism, or a kinder face of capitalism but the continued rampage of neo-liberal economic thinking with a nod to worker participation as a way of heading off the unions. After all, if you have shares in a company then the last thing you’ll be doing is calling for industrial action? This is worker participation, but just enough participation to nullify the unions but not enough to pass any power to the workers or to make any difference to current practices whatever. True worker involvement would mean the reduction in the ratio of high and low earnings within a company, worker participation in strategy and planning together with workers sharing equitably in the success of the endeavour. I would also like to think that it would involve a healthy does of Catholic Social Teaching to give the whole system a moral basis by which everyone would be catered for and not be left behind. 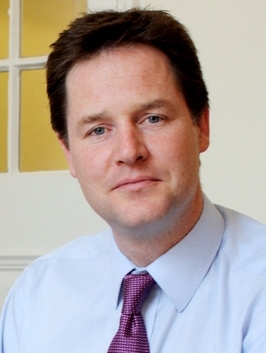 Deputy Prime Minister Nick Clegg has come up with a scheme to help open up top careers to people from less privileged backgrounds. He’s arguing that getting on the ladder in many professions is more a case of who you or your parents know rather than ability, suitability and educational achievements. According to the Mail on Sunday, however, 900 Tory supporters paid a minimum of £400 per head to attend its Black and White Party, formerly known as the Winter Ball, at which an auction of 30 lots took place, including a number of internships. Millionaire backers paid an average of £3,000 each to ensure that their children had a chance to undertake work experience at the companies involved. It strikes a chord with me as I have witnessed my youngest son get turned down for internships and summer placements from bank after bank after bank. This was in despite of his impeccable character and his fantastic academic achievements through the first two years of his mathematics degree at a university renowned for mathematics. The thought of nepotism and cronyism was always lurking at the back of my mind but I feel it’s been confirmed. It’s ended well for him though as he has secured a contract with a local firm including further training and education to obtain a professional standing which will see him well for the future. I do hope that what Clegg is attempting isn’t just a token piece of electioneering, this country desperately needs to embrace equality of opportunity. 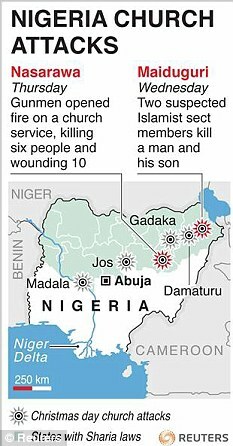 Please pray for those Christians living in the Northern states of Nigeria. It must be awful knowing that there are people who will target you with death just for being Christian. Eschatology : Death and Eternal Life. 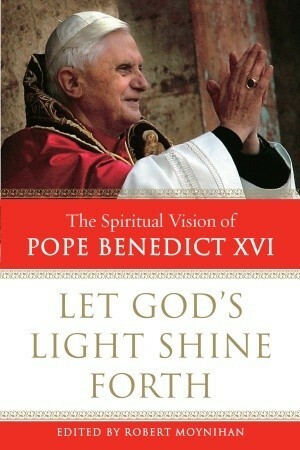 Having read Jesus of Nazareth by Pope Benedict XVI (see this post) I was pleasantly surprised by how readable it was. So I thought I’d give another of his books a go. 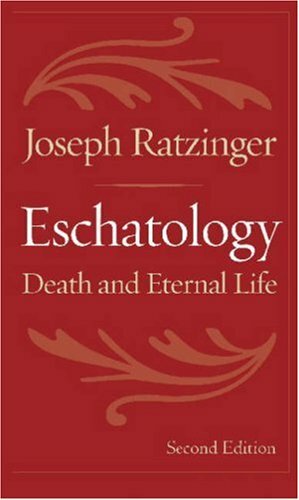 There are a number that I want to read but the only one I could find available in Hampshire at my local library at Farnborough was Joseph Ratzinger – Eschatology : Death and Eternal Life. Let’s hope it’s as readable as the other one of his that I’ve read! You can see all my books at Goodreads or Librarything! Feel free to add me if you have accounts there.